Well, today was my 25th birthday. I ended up having the day off of work so it was a pretty relaxing and quiet day…just what was needed. Then this evening I met up with some of my closest friends for dinner, always a good time. Here we are, at the start of another year and this idea got me thinking. It is not the year that ends of being good or bad. I mean, a year is simply the time it takes the earth to travel around the sun. Rather, the year will be what we make of the time we have ahead of us. So…rather than hoping the year is good, I know it will be good because I am going to take action into my own hands. With guidance from Christ and the support of my friends/family I look forward to seeing what the year holds in store…ironically, I will end by saying it will be a good year! Cheers and stay tuned for stories of my 25th year! Just a couple days ago I got back from an amazing week. I recently started going to a new church (more on that later, but it is a great place!) and was able to go to camp with the students. I was unsure I would be able to get five days off of work since it is our busy season, so I put it in God’s hands…well, long story short I got the time off and was able to go! Our church rented a large group campsite at Alder Lake, near Mount Rainier here in Washington. Unlike most church groups who go to an established camp with cabins and the like, our church does everything on our own. We met up a few days before camp to load a U-Haul with tents, grills, refrigerators, bleachers and the like. Then we met up at the church on Monday, loaded into cars and bus, and headed south. So there we were, 100 students and leaders at a giant camp group site with a week before us…and let me tell you, it was awesome! 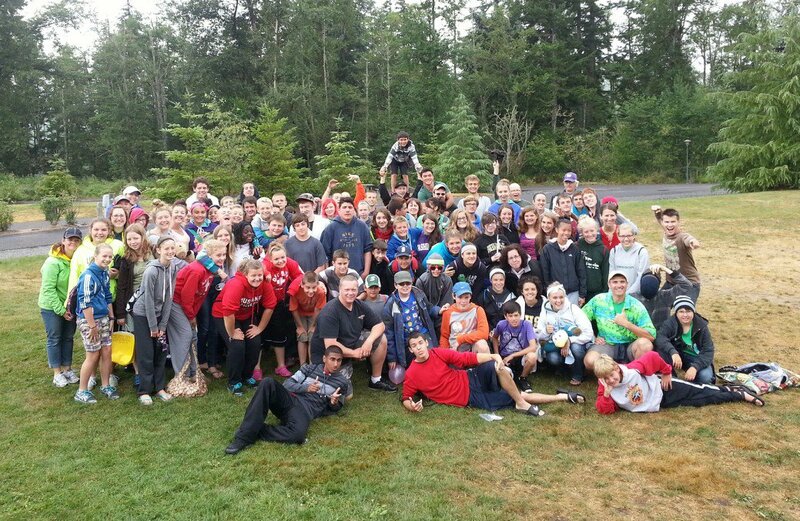 The week was full, we went non-stop, the way camp should be. From group games (geezerball, capture the flag, four-way volleyball, etc…) to afternoon activities (swim time at the beach, canoeing, inter-tubing/powerboats, rock jumping, etc…) the days were packed. The best thing was, there was still so much more to the day than that. While the activities and games were a large part of camp, perhaps the most impactful times were when we were gathered as a group listening to testimonies, worshiping together, and learning from our lead pastor about how to go deeper in areas of commitment, love and more. It can often be difficult to put into words times like these. The best way I can put it: God moved. One of the students put it best, he said, “The Holy Spirit was there and was moving during worship.” Students and leaders alike felt God there, each experiencing something different but equally special. For the week I was a counselor for 7th and 8th grade boys. I shared a tent with 5 guys and we spent the day doing activities and having good conversations. It is slightly ironic, but for the two summers I worked at a camp, I was never a counselor. Heading into the week I was a bit nervous to be in this role, but my nerves were quickly dissipated. The guys were lots of fun and full of energy. We had good conversations, random/goofy conversations and everything in between. Now that I have been back for a couple days, I have had time to reflect about my time at Alder Lake with North View Church. It has been difficult to answer people when they ask “How was camping?” I guess the best answer would be that it was amazing. For me, I now know many of the students, leaders and parents from North View, the church I have decided to start attending on a regular basis. Not only that, but God did speak to me and I now desire to know Him more…but most of that I am keeping for myself, for now. In short, it was an amazing week. Students came to Christ and many others recommitted their lives to Him. We had lots of fun with games, activities and skits. I made new friends and had a great week. I look forward to more great times ahead with these people. I was just perusing through various websites and came across the below picture. 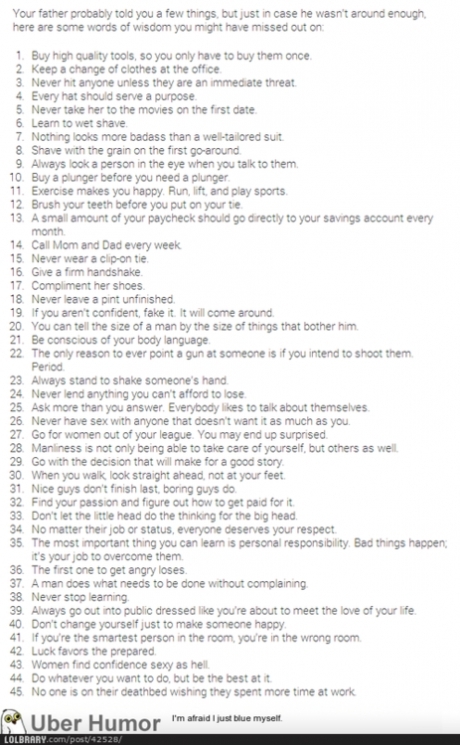 I know it is a bit out of focus but there are some great bits of advice on it! It is mainly for guys but it works for nearly anyone. Check it out and feel feel free to comment with any pieces of advice you may have too. I just came across this online and could not resist sharing! 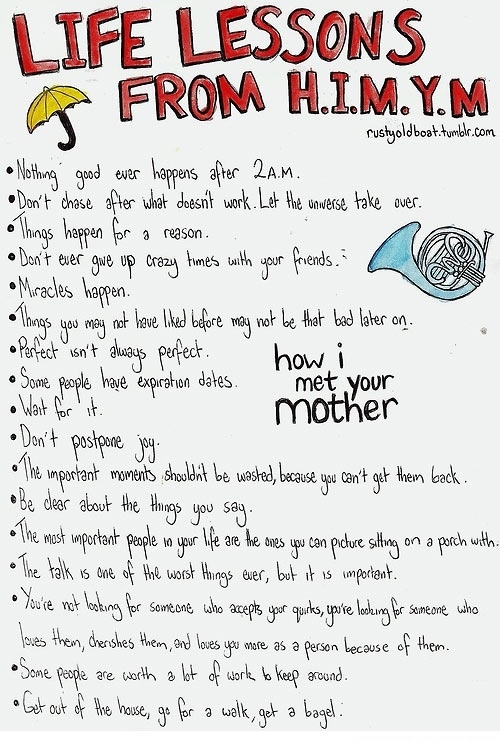 It is a set of lift lessons from the hit tv show How I Met Your Mother, check it out! What are some other life lessons you have taken from shows, books or other forms of media? So if it is okay with you, I would like to tell you a little bit about this weekend, but not in the traditional sense…Yes, I had an awesome weekend. I worked a concert, saw a great new movie and experienced a Seattle sporting victory-all while having a blast with various friends….but the weekend was so much more than that! It is so hard to put into words, but I am going to give it my best shot, bear with me. When I got home late Sunday evening, I felt, well…different- but in a very good way, I assure you! Through everything that had happened over the weekend I felt like God had reached inside me and flipped a switch. It was as though so much of what I have been carrying around had fallen away. I have internalized various feelings, thoughts and emotions that are now gone. 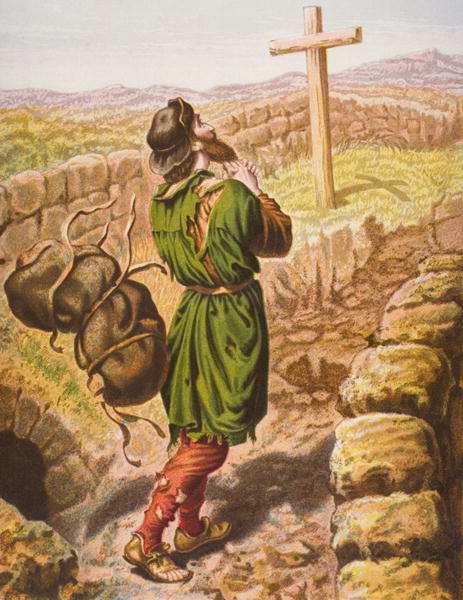 To be honest, I felt like Christian in Pilgrims Progress, when he stands at “the place of deliverance.” Essentially, he comes to cross and when the shadow passes over him, the straps of his burden break, and the burden rolls away. This is really the best way I can try to describe the feeling: it is like my burden has fallen completely away…it is like God reached down and cut it free. As I mentioned above, it is also like a switch inside me has been flipped. I feel my hope in the future restored and my sights completely realigned on Christ and the path He has set before me. Now I am not saying that I was not focused on Christ before, but now I feel it alive inside of me. I have true hope and joy for the future and have been able to let go of so much. The saying goes “time heals all wounds” but I raise a counter “God heals all wounds…in His time.” Sometimes it takes longer than others, but for the first time in a while, I feel healed of so much. I felt God speaking to me last night, and I now see that I am where He wants me to be in this moment. He healed me in His timing, not mine. He truly does make all things work together for my good. I may not be totally sure what the future will hold, but I am confident in the plans the Lord has…all He asks is for me to be obedient and to trust and hope in Him…and I do! This weekend was good in so many ways (look out for another post to come soon!!) but for this I am the most thankful. Through the experiences and friends of the weekend, I truly felt God move and act…how great of a feeling is that! What do you need to turn over to God and give Him a chance to completely heal? I promise you, the outcome will surprise you! When I started thinking about this idea of “should haves,” I tried to think of some examples from my life. Here are a couple things that sometimes I think about, and I wonder: how would my life be different if any of these were on my “done” list, rather than my “should have” list. But here is the thing…no matter what we have or have not done, we are where we are in life because of it. Every time I start to think about these, or other “should haves” I remember something powerful: God has a plan for me and although I do not know what it may be, I know it will be great. As people, we are naturally flawed, and we often think this gets in the way of God’s plan for us. But, I assure you, God has a plan for each and every one of us. So although we may think of the “should haves” and wish we could go back, remember that because of them, you are who you are today. And if you are not who you want to be, remember that life is a journey and you are getting closer to who you are meant to be. You cannot change the “should haves” in your life, you can only look forward and take advantage of the times to come. On a different note, whenever I think of “should haves” I always think of this song. Brings back great memories of the RlazyS Ranch, that’s for sure! Every now and then, we need the blunt honesty of a true friend to put us back on track. I was recently talking with one of my friends and we were catching up on life. As it should happen, I told him about something I was going through, and asked what he thought. In that moment, he showed what a true friend is, by being perfectly blunt and honest with me. It seems like when people are blunt and honest with us, we tend to shut down and get defensive, but in this moment I realized the truth in what he was saying and elected to listen and take in his words. And as luck would have it, he was right on the money. He said the thing I needed to hear, and have probably needed to hear for a while. It was truly God speaking through him in that moment, and for that I am so thankful. Take away- Be open to listening to people when they are honest with you. Your true friends are saying it because they care about you. It just may be that the Lord is speaking through your friend, and that is something you will not want to shut out.